“Small businesses are what makes the world go round!” Kathleen Carroll and her Fairfax-based gift and plant boutique are living proof that her soundbite proves true. Kathleen dreamed of owning a cute little mom and pop shop, and with time, her dreams were realized when she founded Potting Shed with her husband. A lover of all things plants and gardening, Kathleen’s Potting Shed is a true embodiment of what she loves most: an indoor-outdoor environment exposed to the elements and immersed in nature. Given Kathleen is a self-described “visual person” with an eye for aesthetics, it comes as little surprise that The Potting Shed itself is geared towards lovers of beauty and art. Succulent flower and plant arrangements hang from the wooden ceilings and flowers line every step. “A lot of people tell me they come to the shop just to feel better!”, Kathleen laughs, admitting that she thinks her store has beautified the small community in Fairfax The Potting Shed calls its home. A typical day at Potting Shed consists of putting plants and merchandise out onto the street to attract customers, taking care of the plants, assembling succulent and air-plant arrangements, and making deliveries. Kathleen prides herself in owning a unique shop full of personal touches and thoughtful attention to detail. From the tender thought and care with which Kathleen assembles arrangements to the hours she spends watering, picking, pulling, and tending to her plants, she shares her love of plants with others and hopes to further beautify her community through an expanded delivery program and perhaps even an online store. 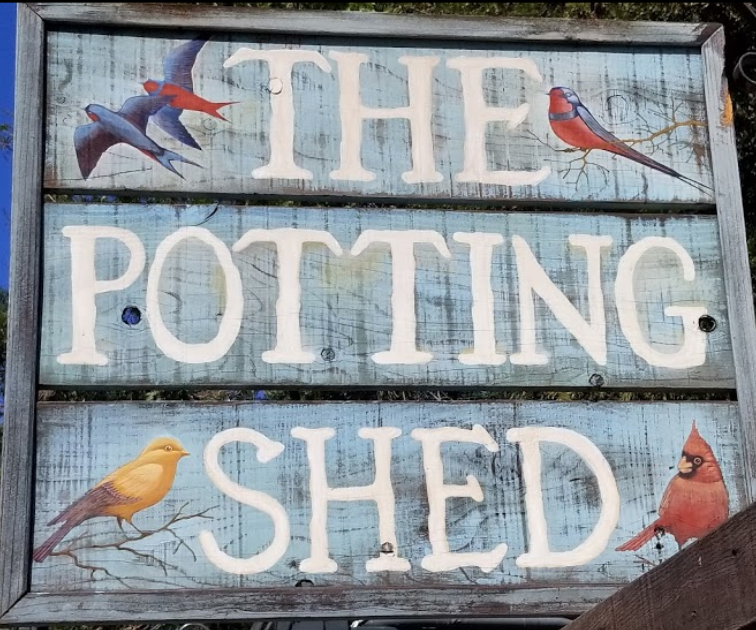 When asked to describe The Potting Shed, Kathleen concluded by saying “it’s a really nice and soothing place to be”, and reiterating how much she enjoys her work there. Indeed, Kathleen and her business are truly positive lights in the Fairfax community. She keeps The Potting Shed community-oriented through using succulent classes as a vehicle for ensuring that her shop is “a place to be inspired and to learn”, rather than to merely “buy things”. By keeping the full potential of such a shop in mind, Kathleen makes The Potting Shed more than just a unique and dynamic boutique. She hopes to use her artistic eye and passion for plants to make visiting The Potting Shed an educational experience rather than just an aesthetically pleasing one. At the end of the day, The Potting Shed inspires, teaches, and beautifies Fairfax under the nurturing hands of Kathleen Carroll. To read more about Kathleen Carroll and the Potting Shed, learn how to attend a class on succulent arrangements, or plan a visit, go to http://www.potting-shed.com/.